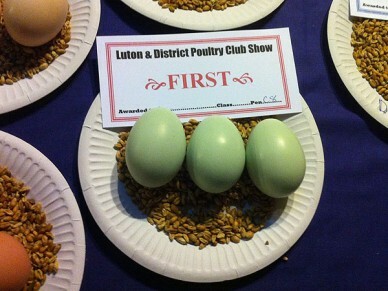 Egg showing can sometimes get overlooked in favour of the bird competitions but selecting the perfect single, trio or half dozen for show day success is not as easy as you might think and winning an egg class can be every bit as rewarding as receiving a rosette for your poultry. Seasoned egg show contestant Brian White is on hand with some tips on choosing the best of the clutch. The most important thing when showing eggs is to have shells without blemishes, marks, hairline cracks or pimples. Any colour egg can be shown – brown, white, blue, green, or tinted – these are the ones with dark spots on a lighter background. For dark brown eggs, such as those from Marans or Welsummers, try to pick eggs with non-mottled colour. If there is mottling ensure that it is as even as possible. White eggs can be difficult as they do suffer more from cracks and stains any of which are more prominent on a white background. Eggs should be ovoid, the long axis approximately one and a half times the length of the short and the widest part about one third the length of the egg from the broad end. There is no weight limit for large eggs, but for bantam eggs the maximum is 42.5 grams or 1.5oz. Shape does vary with breed and a good example of this are Marans whose eggs tend to be a good shape whereas French Marans have a lovely dark shell, but are a bit too rounded each end. Nice clean nest boxes are important to get clean eggs without scratches. Judges will look for a nice ‘bloom’ as a sign of freshness so if you do need to clean an egg it is best just to wipe over gently with water and dry off. Do not try to polish eggs as they will be disqualified. Single eggs are easier to show than threes or sixes simply because it is more difficult to find three eggs the same size, weight and shape and even harder to get six exactly the same shape, colour, and texture. However, it is worth spending some time and effort on multiple entries as the show champion eggs nearly always come from these classes. Consistency is king and for this reason the best groups will usually be laid by the same bird. Eggs are usually shown in dishes, resting on a layer of wood shavings or grain and groups are shown with the pointed end towards the centre. If competition is very stiff then it will come down to fine details, especially in the group classes, so weights, proportions, finish and even freshness will all be very important. 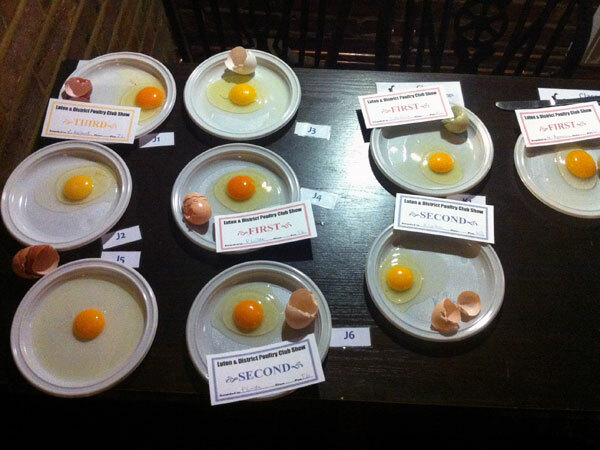 When showing egg contents, the shell is not judged, and is discarded, so any colour can be shown in the same class. They must be fresh, about one or two days old is best, with a well coloured, nicely domed yolk centrally sited in the albumen. Hens that get plenty of greenery along with good quality layers’ pellets will produce eggs with good coloured yolks. 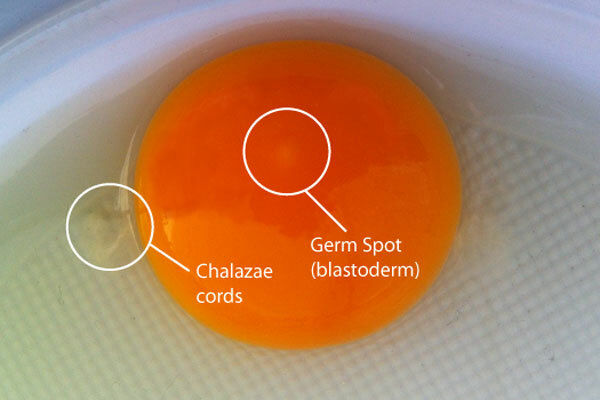 The standard calls for a golden yellow yolk – not too light or to deep an orange – with the germ spot and the chalazae chords both visible. Yolk should have no blood spots. The albumen or white should be firm and distinct (see pic) and certainly not spread all over the plate. I would certainly encourage you to have a go at showing your eggs, even if you are new to it and still have questions there will always be somebody happy to show you anything you need to know and you’ll have a cracking good time into the bargain. Brian White has been showing eggs for about 10 years mostly locally. He has won Best in Show four times at Northampton Poultry Club, twice Best in Show at the Herts Show, and twice at Luton Poultry Club. Do they have egg shows in USA ?…How do I find information about this ?